The housing shortage for Canada’s First Nations has long been a problem, which has been exacerbated by governmental cutbacks. But a new “One House, Many Nations” campaign aims to build year-round housing for families, and in particular to get one Inuit family out of a tent and into a newly-built house before the snow begins to fall. The plan is to build “trapper log cabins” – which include windows, a door and kitchen sink, solar panels, wood stove, box garden and composting toilet – at a cost of $15,000 per house. The campaign is looking for donations of materials and for volunteers to help with the actual building. A clever idea, on the campaign’s website people can also opt to pay for individual items, such as contributing $25 towards nails or a sheet of drywall, or $75 towards a wood stove. In the first week, donations worth a quarter of the cost of the first house have been received, including six $100 contributions towards solar panels, now a sold out item. 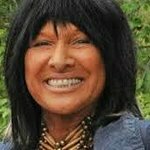 Singer and song-writer Buffy Sainte-Marie is lending her name to the effort, and is donating autographed copies of her CDs to be raffled, including Power in the Blood, which won this year’s Polaris Music Prize (best Canadian album of the year). Go here to watch the campaign’s progress, or to make a donation. Winter is coming.